The thymus may play a central role in the regulation of autoimmunity that drives the coexistence of systemic lupus erythematosus (SLE) and myasthenia gravis (MG), as well as in treatment response of patients with both disorders, a case series suggests. This finding resulted from an analysis of four cases of MG patients who also met the criteria for an SLE diagnosis. The cases were described in the study, “Systemic lupus erythematosus-myasthenia gravis overlap syndrome: Presentation and treatment depend on prior thymectomy,” published in the journal Clinical Immunology. SLE, also known simply as lupus, is an autoimmune disorder characterized by increased inflammation that can affect several organ systems, including skin, joints, kidneys, blood cells, and nervous system. MG affects about 1.3 percent of patients diagnosed with lupus, and it has been described as an important contributor in the development of lupus symptoms such as fatigue. The thymus is an important organ for the maturation of immune cells, where they are trained to distinguish foreign and potentially harmful substances. Given this important role, the thymus has been pinpointed as a major trigger for the production of autoantibodies, or antibodies that attack the host own tissues, involved in MG. Still, its role in lupus development remains poorly understood. The first patient in the case series, a 62-year-old woman, had been diagnosed with MG after a positive anti-AChR antibodies test in 1986. At the time, she started treatment with Mestinon (pyridostigmine) and underwent surgical removal of the thymus, or thymectomy, which significantly improved her muscle weakness. About 23 years later, she was diagnosed with lupus and started treatment with Plaquenil (hydroxychloroquine) to manage joint swelling and tenderness. During this period, her MG symptoms got worse, with eyelid weakness and facial asymmetry with muscle paralysis. All her MG and lupus symptoms significantly improved after treatment with an increased dose of Mestinon and Plaquenil combined. The second case presented was of another woman, age 56, who had been diagnosed with MG at 10 years old. She was first treated with Mestinon, but underwent a thymectomy when she was 20 to improve her persistent muscle weakness. Her health continued to deteriorate, and approximately 34 years later, she was bed-bound, unable to move her lower extremities and had only limited movement of her upper extremities. 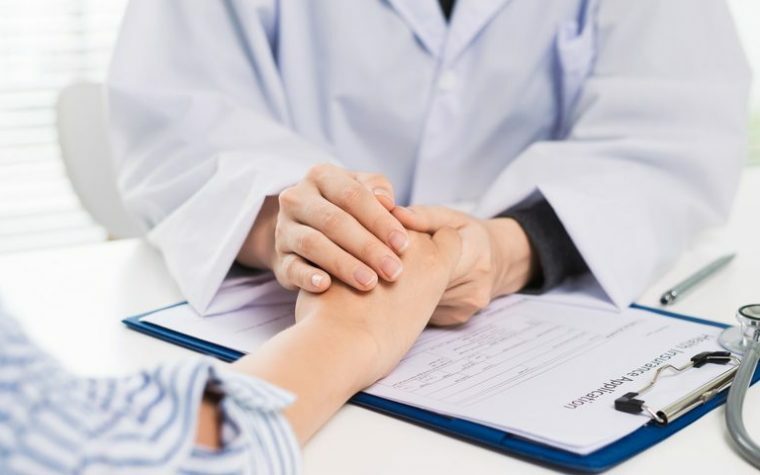 Further evaluations revealed she met five diagnostic criteria for a lupus diagnosis, and started treatment with Plaquenil. The third patient, a 57-year-old man, had been diagnosed with MG three years prior after a positive AChR antibodies test. He was first treated with Mestinon, which failed to improve his muscle weakness. Further evaluations showed he had tender and inflamed joints, and also had a history of pulmonary embolisms — a blockage of the blood vessels in the lungs that may cause tissue damage. Lab work and a physical examination confirmed he had lupus and antiphospholipid antibody syndrome. Based on these new diagnoses, he started treatment with CellCept (mycophenolate mofetil) and Plaquenil, which significantly improved his muscle weakness, fatigue, and joint inflammation. The last case presented by the researchers was a 58-year-old woman who was first referred to her physician for a possible lupus diagnosis. She experienced severe fatigue and morning stiffness of the hand joints, shortness of breath and chest pain, and had a history of seizures and stroke. Laboratory analysis confirmed she had lupus, and she started treatment with Plaquenil. One year later, she was no longer taking Plaquenil, and she started to experience eyelid weakness and double vision, which were attributed to the lupus. Two years later, she was screened for MG and antiphospholipid antibody syndrome based on a clinical history of strokes and muscle symptoms, which were confirmed with an autoantibodies analysis. Based on the course and outcomes of these four cases, the researchers suggested that the thymus could be an important player in lupus development and in treatment response. “We hypothesize that patients who have ‘classic’ MG and underwent thymectomy develop SLE due [to] a breakdown in central tolerance,” the researchers wrote. On the other hand, they believe lupus patients may develop MG due to the increased production of autoantibodies against AChR “within the scope of their systemic autoimmunity,” they said. Additional studies are warranted to further investigate the role of thymus and the impact of its removal in mechanism of autoimmunity, both in humans and animal models, the team said. Tagged case series, Lupus, outcome, systemic lupus erythematosus, thymectomy, thymus, treatment. I recall having a rash on my hand since I can remember! Diagnosed with MG (1972/73) when I was 9 years old and had my thymus gland removed in 1973 that significantly improved my muscle strength, the rash disappeared after taking large dosages of prednisone. About 5 years later diagnosed with SLE Lupus. Currently treated with Mestinon (pyridostigmine), CellCept and Prednisone (15mg every other day). Because of the rash, maybe the lupus was already present before MG surfaced!